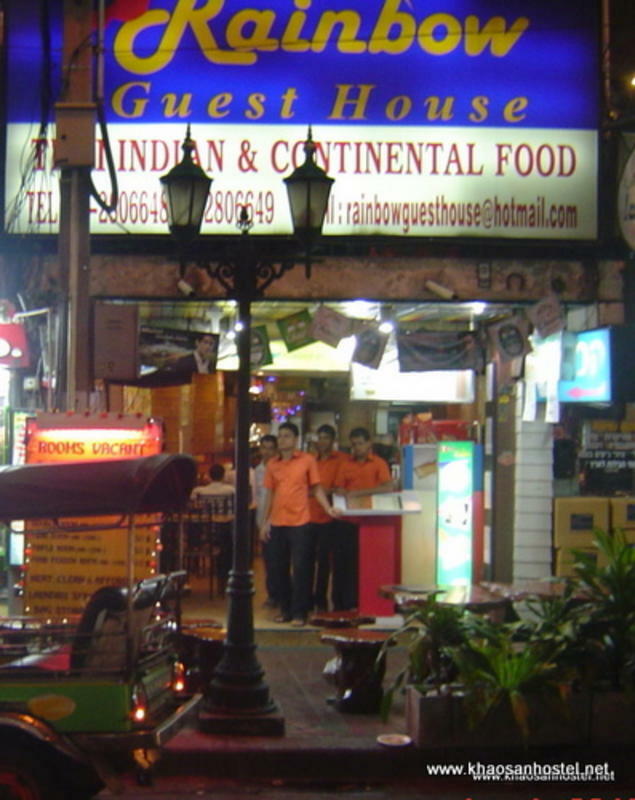 Khaosan Road Rainbow Hostel and Guesthouse is conveniently located only 20 meters from busy Khaosan Road. Rainbow has been in business since 2001 and over the past 9 years we have served thousands of travelers. Our Hostel features both Aircon and Fan rooms, offers free Wifi internet throughout, safety lockers, and hot showers. Our guests come from all over the world and enjoy the community we offer, only a 2 minute walk from the legendary Khaosan Road. On the first floor is an excellent Indian restaurant, with Indian chefs, serving a vegetarian Thali (set menu) for just 140THB. The restaurant also serves great tasting, Thai food, & 80THB American breakfasts as well. We also offer fresh ground coffee, cappuccino, espresso, etc for bargain prices (starting at around 40THB). Our hostel is located about 20 Meters from the Khaosan Police Station, at intersection of Khaosan Road and Chakrapong Road. We are directly across the street from Gazebo Night club. By direct Taxi from Airport. The airport link from Airport will cost you 45 Baht from Airport to Makkasan Station(Last airport link station) and then by Taxi to Khaosan road will be approx. 60-70 THB. If you wish to come by taxi, Please get one from Departures (NOT ARRIVALS) because the pessengers who are going to leave out of Thailand will depart from Departures and taxi from departures have to come back empty so they bring you to your destinations for the meter price which is Maximum 300 THB. to Khaosan road. Using any of the upper given option, Get down if front of CHANA SONG KRAM POLICE STATION. (This is the starting point of Khaosan road) and Rainbow guest house is located only 20 meters away opposite side of this police station . Buses to Koh Chang, Koh Phangan, Phuket, Laos, Chiang Mai, etc all leave from in front of our hostel as well. The Lomprayah and Sea Tran bangkok bus station is about 300 meters from our hostel.